REGIONAL NEWS - AFRICA 24 E&MJ • DECEMBER 2017 www.e-mj.com Acacia Agrees to Pay Tanzania $300M By Gavin du Venage, South African Editor Acacia Mining has blinked in its dispute with the Tanzania government, which does not bode well for other miners facing a similar standoff over legislative uncer- tainty, analysts said. In March, Tanzania President John Ma- gufuli banned the export of gold and cop- per ore produced by the country's largest gold miner, Acacia Gold, majority owned by Canada's Barrick Gold. The government also levied a $190 billion fine on Acacia — equal to about two centuries of revenue. Magafuli had accused Acacia of un- der-declaring the value of its exports, therefore reducing its tax and royalty bill. Acacia and its parent denied the claims, but in late October finally opted to settle. A payment of $300 million will be handed over, and the government will be given a 16% free carry stake in Aca- cia's properties — Bulyanhulu, Buzwagi and North Mara. Crucially, the agreement also said eco- nomic benefits from Acacia mines will be shared on a "50/50 basis" with the Tan- zanian government. Acacia's CEO, Brad Gordon, and Andrew Wray, the CFO, have since announced their resignations in ear- ly November. Acacia is not the only operator tar- geted by the government. In September, local authorities seized a $15 million consignment of diamonds belonging to London mining firm Petra, and briefly de- tained some of its executives. The gems were sourced at its Williamson mine and en route to Antwerp for processing. As with Acacia, the government alleged Petra had under-valued the consignment. "While Williamson Diamonds de- clared in its documentation that the val- ue of the diamonds was $14.8 million, a fresh valuation done by the government established that the actual value of the diamonds is $29.5 million," an official government statement read. A Petra spokesman referred to the com- pany's official statement on the matter, which said its Tanzania mine's products are valued by government officials, not its staff. "Petra is not responsible for the provisional valuation of diamond parcels from Williamson before they are exported to Antwerp," the spokesman said. "This is carried out by the government's Diamonds and Gemstones valuation agency." Tom Scurfield, the Tanzania analyst at the London-based Natural Resource Governance Institute, said citizens sus- pecting companies of dodging tax is a long-standing problem. Mostly, it's the re- sult of impoverished communities seeing little of the benefits of mining operations trickling down, he added. "While countries undoubtedly do lose from such practices, some combination of generous contracts, ineffective use of collected revenues and mismanaged expectations are often also to blame," Scurfield said. "Tanzania is arguably a pertinent example of how these different factors can come together with far-reach- ing implications." The disputes have also hurt the junior sector. 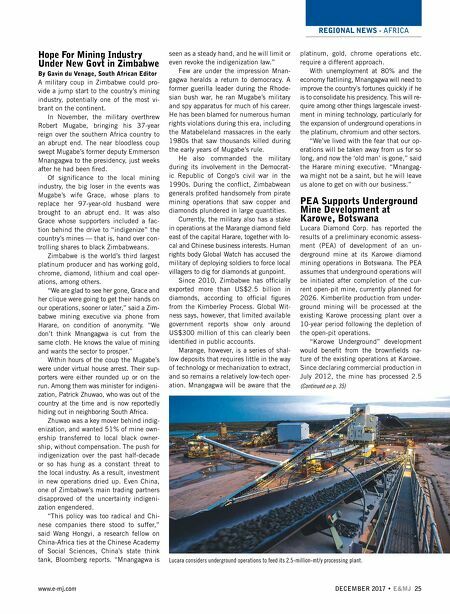 Tanzania is attracting tin, nickel, gold and gold projects. According to Reu- ters, several juniors have halted explora- tion and one has closed its office. Manas Resources, a junior pursuing the acquisition of Victoria Gold in north- ern Tanzania, is one of those that may re- think investment plans. Manas CEO Phil- ip Reese told Reuters the timeline around the deal was now uncertain. "Because of the changes in legislation and the time being taken to implement new regulations, the sector has slowed down to a point where it is impacting exploration activities and our capacity to finalize the deal," said Reese. Dan Paget, a scholar at Department of Politics and International Relations, University of Oxford, said, however, that Magufuli's administration may be more cautious in its treatment of juniors. 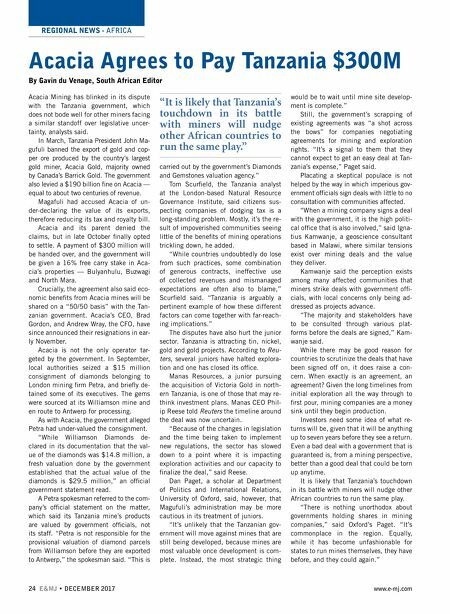 "It's unlikely that the Tanzanian gov- ernment will move against mines that are still being developed, because mines are most valuable once development is com- plete. Instead, the most strategic thing would be to wait until mine site develop- ment is complete." Still, the government's scrapping of existing agreements was "a shot across the bows" for companies negotiating agreements for mining and exploration rights. "It's a signal to them that they cannot expect to get an easy deal at Tan- zania's expense," Paget said. Placating a skeptical populace is not helped by the way in which imperious gov- ernment officials sign deals with little to no consultation with communities affected. "When a mining company signs a deal with the government, it is the high politi- cal office that is also involved," said Igna- tius Kamwanje, a geoscience consultant based in Malawi, where similar tensions exist over mining deals and the value they deliver. Kamwanje said the perception exists among many affected communities that miners strike deals with government offi- cials, with local concerns only being ad- dressed as projects advance. "The majority and stakeholders have to be consulted through various plat- forms before the deals are signed," Kam- wanje said. While there may be good reason for countries to scrutinize the deals that have been signed off on, it does raise a con- cern. When exactly is an agreement, an agreement? Given the long timelines from initial exploration all the way through to first pour, mining companies are a money sink until they begin production. Investors need some idea of what re- turns will be, given that it will be anything up to seven years before they see a return. Even a bad deal with a government that is guaranteed is, from a mining perspective, better than a good deal that could be torn up anytime. It is likely that Tanzania's touchdown in its battle with miners will nudge other African countries to run the same play. "There is nothing unorthodox about governments holding shares in mining companies," said Oxford's Paget. "It's commonplace in the region. Equally, while it has become unfashionable for states to run mines themselves, they have before, and they could again." "It is likely that Tanzania's touchdown in its battle with miners will nudge other African countries to run the same play."